Here is my most recent progress on My Lady’s Collection. 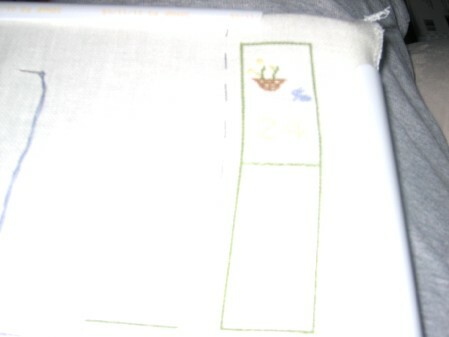 I am really loving stitching on this one and am so tempted to pull out my Ezmerelda’s House pattern. No…bad Leslie! I am almost done with the first of the three needle books. This is for size 24 needles, but you cannot see that the number is stitched already. For some reason, I can’t get a good pic of this one. It is either totally out of focus or full of glare…oh well. I also finished up part six of my Mystery. I know I took pic of it, but I can’t seem to find it on my camera. Hopefully, I will be able to finish pare 7 over the 4th of July weekend. Great progress, Leslie! Do you have a “snow/beach” setting on your camera? I have one on mine and find that it works well when taking photos of pieces stitched on white fabric.